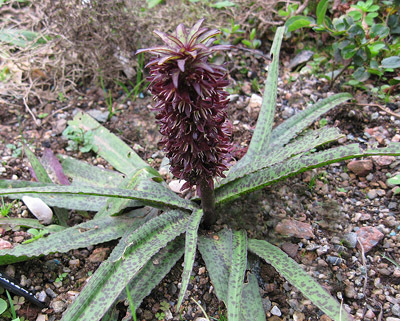 Eucomis vandermerwei is a stunning member of the Hyacinthaceae family from the Transvaal in Africa, mostly in the highest outcrops of the Steenkampsberg (east of Johannesburg). Like all the other members of Eucomis it is commonly known as the Pineapple Plant because of the topknot of leaves above the flower spike. 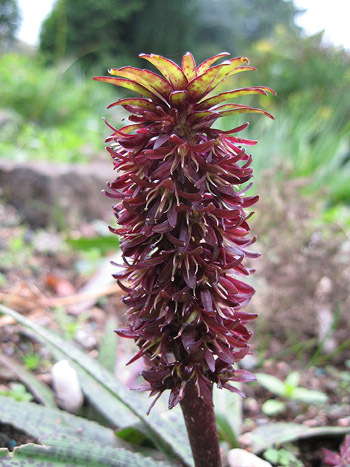 Eucomis vandermerwei is one of the smallest in the genus, growing not much more than six inches or 15cm high. The wavy edged leaves are heavily speckled in purple. The flowers, purple with yellow anthers, appear during August and September and can last into October. This plant is thought to be one of South Africa's rarest species. It does very well in a rockery or in a terracotta pot but the contents must be very free draining. If very heavy frost is forecast give the bulb some extra protection with fleece or mulch. If it is grown keep it frost free over the winter. Its hardiness is not fully known just now. A few blue 'sweets' will keep the slugs away.